Wow, 5 year old thread guys! No I don't know anything about them, had the neck by itself for a project. Marshall Echohead, Boss NS-2, MXR 6 band EQ, Digitech SC-2 Valve distortion for sale. All are unboxed, and tatty (gig marks!). All working. All prices are based on eBay completed listings. I'm in Swindon, Wiltshire, can meet up or post. OK mate, just send me a PM when you find the laptops! UK Wanted: any faulty/broken laptops. I purchase (almost) all broken laptops for cash, doesn't matter how broken. Let me know what you've got and what's wrong with it and we'll work out a price from there. I have one that's been gigged and the box is tatty, make an offer mate? Necrobump. Will consider ANY laptop/netbook. Fair enough, I'd take it off you 100% at £100 delivered. Anyone for the orange or the charvel? OK, consider it sold. Text me your address, postcode etc so I know how to find you tomorrow. Any news about Monday yet? I presume you got the PM with my mobile number OK? Ok, drop me a PM with your mobile number and when you can collect. Gary - I'll keep you updated on what's happening, if I've not heard anything by Monday then it's yours.. If you pick me, PM me to let me know when is best for you & I'll come over. Well I sent the other guy an email and I've had nothing back so it's yours I guess. Monday afternoon is fine. Tomorrow afternoon would be better but I can keep it until Monday for you if you'd rather. Drop me a PM with your mobile number and I'll text you when I next get online. I've been thinking about it and I really can't be bothered with posting it, so I'm gonna have to decline. My apologies. Back to the other 2 to decide who gets it. Museaddict I dropped you a PM. The other 2: We now have a dilemma. I'm happy to sell it to one of you for £30 as I need that £30 to pay my monthly insurance -.- but who should get it? Gary was first but lanky was the first to offer £30. Both of you try and persuade me who should get it? I guess it's whoever can get me the money soonest. I also have a tatty bass hardcase for sale for £20, and a regular hardcase for £40. Sold ages ago, but PM'd you anyway! yeah mate the vintage looks great, also pretty interested in that dell laptop need a little work lappy and that looks perfect. Can you put some cash in too? Do you mean the M1530 gaming laptop? If so, on ebay they sell for more than the valveking is worth! I can't put any cash towards any trades as I'm broke and in debt! Quite possibly mate - you were interested in the Vintage when you came to pickup the strat a while ago?? What are you thinking deal-wise? I'll let you know about the double neck, I'm not sure on selling it just yet as it's so little work it needs doing!! 1) Epiphone nuclear x-treme les paul. Hope that picture works... It's a lovely guitar, very thin neck and a very low action. Unfortunately, the switch is buggered and has no tip. It kinda works, you can select the bridge or neck pickup, but it isn't grounded and the middle position isn't wired correctly. It could probably use a setup too. The picture shows it to be black and yellow, and it is depending on the light, but it's really blue and yellow. Looking for about £200 for that. Absolutely beautiful guitar that's been very neglected by me for a while now. Sadly after a nasty incident the guitar has been left with no toggle switch, it's stuck in the middle position so you can use the volume knobs to select which pickup you're using, so I never got around to swapping it. Again, an amazing guitar I promised myself I wouldn't sell, but I need the space. It has Ibanez active pickups which are powered by double A's for conveniance, a nice round ish neck which is very comfortable. No real problems with this one, although it could do with a setup again as the action is a bit high on the upper frets. It's in drop C atm. Paid £170 for it, and that's what I'd want back for it. The neck on this is beyond repair quite frankly. When I received the guitar, the area for the nut had been filed away and then bodged with cheap wood filler and a cheap nut stuck on top. I never did anything with it as I didn't see the point; a new neck is needed. The nut and tuners are reusable though, and the body includes all wiring, although I've no idea if it works or not. Only want about £30 for that. 5) Boss NS-2. Unused for a while, I think I have the box somewhere but it's probably damaged. £50 ish seems to be the going rate. £200 would see the entire collection gone. 7)Hiwatt G200r/HD head and Marshall AVT412 cab. The amp is a tricky situation. It has a load of backround noise and hiss, and the OD channels are MUCH quieter than the clean channel. Also, the volume drops low occasionally and then will pop back up to normal unexpectedly, and there's no pattern to it. Annoyingly, the OD channel is the best on any SS amp and when it is working, it really does sound great. 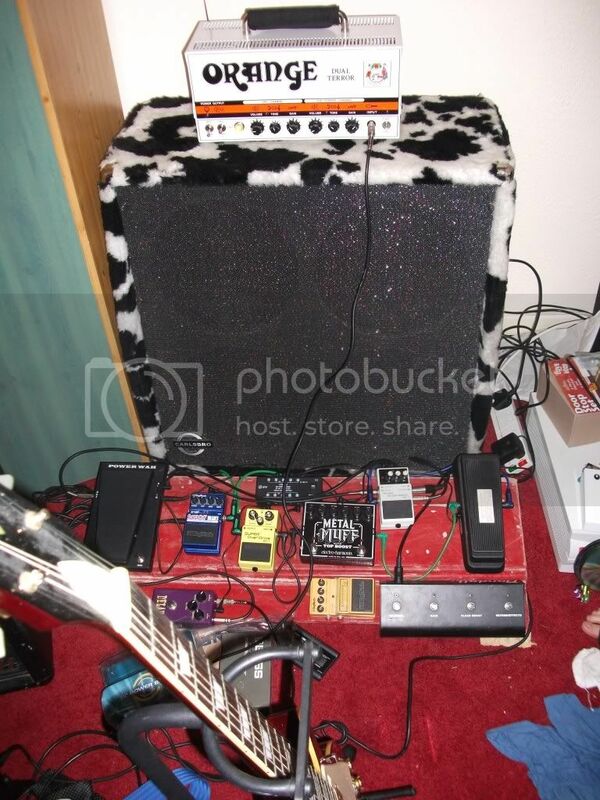 It's also been very gigged in a Rammstein tribute band so it's got a few nicks in the tolex! Paid £70 for it and I'd like that back. Easy fix for someone with time and inclination. Sadly it's too overpowered and huge for what I need these days! The cab is an AVT412, and projects extremely well for a cheap cab. One of the best I've played through. Selling as I've really no need for a 412 anymore... £100 seems to be the going rate for these things. has a 12 string and a 6 string neck, all electronics are present but untested. The 12 string needs a new nut, the 6 is only on the body with 2 screws, it has no knobs etc. Needs a bit of work, but nothing difficult. I just can't be bothered! £30. I'm near Swindon for collection, and I'll happily consider any trades for any of the items. I really want an Ibanez IC400 iceman, and a small valve combo. I have a Boss NS-2. It's been gigged, has a box I think but not in great condition. Probably after about £50. [WTB] Random parts, amps, pedals - Lookie here! Bump - does no one have any interest in this? I desperately do, unfortunately I've just spent my whole wages completely forgetting about this! I've wanted a GT-8 since they came out Are you gonna be putting it on ebay or anything drastic soon? I intend to get a GT8 as soon as I can.. I've got one of these going spare if you're interested? Just throwing this out there, that LP is insane. I play it on it all the time and it's a complete one of a kind, never seen another like it despite several nights searching google. I almost bought it for £250 a year back but he wouldn't sell it to me at the time. will you pay for the postage of the ns2 if i pay £45? Yep! £45 posted is fine. Pitchblack, screamin' blues and metal muff all sold subject to payment. But it shows all three pedals. I'm near Swindon, Wiltshire. Can provide pics tomorrow! I dunno if it's this amp or the model in general, but on my amp the clean channel is ALOT louder than the OD channels. The amp's distortion is great but because it's quieter than the clean channel, the amp is great for using pedals.. I have used and gigged it this way for a year with no problems. Cab is very good for a budget model - best projecting cab I've ever had and sounds very clear and accurate. Looking to downsize as I no longer need a 200w halfstack!